All the TV media, and some other outlets, last night ran stories about the 38 new trains coming (the first at the end of this year), and how they’ll only run on part of the network. I thought it was a curious angle to take, as it’s not really all that important. Back when the suburban rail network was split into two back in 1999, a condition of the two companies’ contracts was to buy new trains. M>Train bought Siemens trains, Connex bought X’Trapolis trains. When you buy new trains, you have to make sure they run correctly on the network. Make sure the carriages aren’t too wide for the stations (as happened with the Siemens trains), make sure the drivers can see all the signals and platform mirrors properly (significant for the X’Trapolis trains because unlike the other types used in Melbourne, the driver sits in the middle of the cab, not on the left hand side). 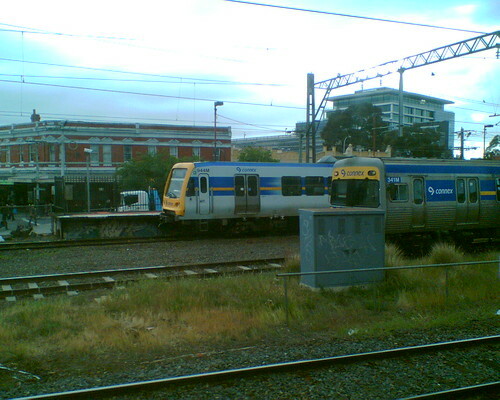 Because of this, when the two operations merged back in 2004, they kept the Siemens trains confined to the old M>Train lines — the lines through North Melbourne and South Yarra (known as the Northern and Caufield groups) — and the X’Trapolis trains confined to the old Connex lines — the lines through Burnley and Clifton Hill (cunningly known as the Burnley and Clifton Hill groups). That’s why you would never see a X’Trapolis train at Caulfield, for instance. OK, well, almost never. That happened by accident. When the government finally decided they needed to buy more trains, they wanted to do so quickly, which meant buying a type already running. They knew the Siemens trains had had issues with brakes, so it was no great surprise that they opted for more X’Trapolis trains. The media reports got the implications of all this a bit muddled. It’s not like the 38 new trains will go onto the Burnley and Clifton Hill lines and no other lines will get extra trains. Some Comeng trains (which can run on any line) will move across onto the other lines, so the whole network benefits. The one thing that is significant is that the Northern and Caulfield groups will end up with a higher proportion of Comeng trains, which as we now know are more vulnerable to air-conditioner failure in the heat, when it goes over 34.5 degrees. This is the real impact of it, and I think only the ABC TV news really spelt it out. But the government was right to order the trains that could be delivered the quickest. It would have been silly not to do so in the face of such bad overcrowding. What they have to make sure happens quickly is that the Comeng trains get their air-conditioning upgraded (they’re testing this in coming months) and it may well make sense that in due course they eventually clear the X’Trapolis trains to run right across the network when necessary. If you’ve been wondering about all the various upgrades happening around the Melbourne rail network, check this fancy shmanzy interactive map on the PTUA web site. ← Previous Previous post: Wii Sports Resort – For The Win! So what lines can’t the Siemens run on… and did they have to “chop off” the edge of any platforms on the South Yarra/North Melbourne lines? Would the train actually hit the platforms of some stations if it ran out on the Burnley/Jolimont type lines? What i find funny is that at some platforms the Siemens trains are significantly higher than the platform, so it’s quite a step up or down. I wouldn’t want to be a little old lady or many having to make that step, especially in a hurry. All I keep hearing is how those dratted Somali pirates are going to hold up Melbourne trains… arrrrrr me hearties stand and deliver a la Adam and The Ants? Art: You’re thinking of the Outer Circle line, which went from Fairfield through East Camberwell then via the Alamein line, to Oakleigh. There was also an Inner Circle. Nathan: I don’t know if they’ve ever checked; they’ve just kept the Siemens on the lines they know are okay with them. Jayne: Yeah the pirates thing is amusing, though what most commenters on the Herald Sun web site ignored was that the ship’s course had been altered to avoid the risk. Heard of this film? It ended up on the Post Punk Mixtape #1 at MIFF for some reason. Two young girls leave their dragon on a tram and go back to the depot at night. A beautifully minimalist work that lingers in the mind. Remember the double storey trains that were only able to go on the Belgrave/Lilydale lines? They will have to make the X’trapolis trains run system-wide when the Comeng trains are phased out. This is yet another problem with franchising. When the government split the franchises in 2004 and allowed both companies to choose a new train, it was destined for problems like such. The Siemens have proven to be reasonably unreliable in Melbourne, with the Siemens trains being too wide for platforms and with braking prblems, and now with the Combino trams (also built by Siemens [and also ordered by M>Tram!]) found with microscopic cracks. In my personal opinion, Alstom should have been given all tenders to build all new trains (X’trapolis) and trams (Citadis), or at least choose one manafacturer and stick to it! Maybe not. By that point the Comeng trains will mostly be on the Northern and Caulfield groups, which have the busiest lines, and the following set of “next generation” new trains are slated to be higher-capacity, faster loading (read: more doors)… so I wouldn’t be surprised if those trains run mostly on those lines too. Hmmm… next generation trains. Very interesting. The next generation trains would have to have higher capacity if the government wants to call Melbourne’s system a metro, because it’s not. At the moment it’s a clogged up old mess, and a lot of work needs to be done to get it to a metro state (i.e. more frequent and simple lines, more underground networking etc.). But I still think it would’ve been nice to have a universal train. It would’ve allowed possibly even more services (say when the Siemens lines are in a shortage and the X’trapolis aren’t) but I can’t be certain on that one. Most of my fellow public transport users can get fed up when they get a streak of older trains, but nevertheless, the Comeng trains are still in excellent working order.